The last version of MetaTrader required offline charts for anyone that wanted to create a synthetic currency pair or instrument. 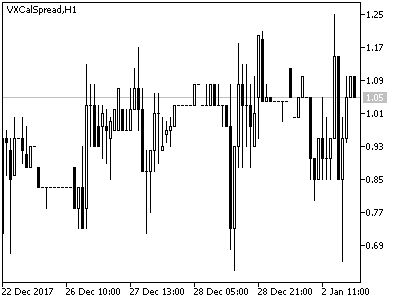 Since MetaTrader 5 still does not allow for offline charts, the ability to create synthetic time frames isn’t possible using the charting time series. The new build 1640 for MT5 introduces the ability to create synthetic instruments. I, for example, want to watch VIX Calendar Spreads. Instead of just using my indicator, I also would like to see a chart that helps me track the calendar spread. Right click on the Market Watch window (look to the image on the right). 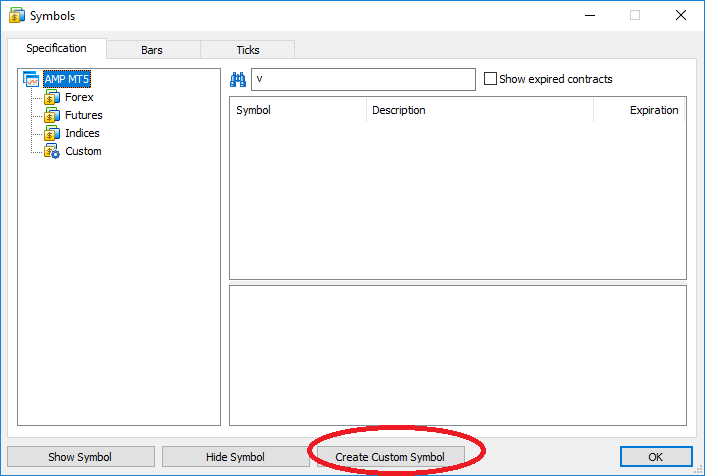 You’ll see Symbols appear in a dropdown menu. Click on it. Alternatively, just push Ctrl + U on your keyboard. Now enter in the Synthetic Instrument name. The name can be anything that you choose with allowed characters. The most important step is to enter in your formula. As you can see in the image below, mine is a symbol subtraction. The primary keywords that you’ll use are bid() and ask(). So, if you want the bid of EURUSD, for example, you type in bid(EURUSD). Finally, make sure to set the number of digits in your instrument. Otherwise, your chart will show a large number of unwanted, extra decimals.